First and foremost, to have this album on vinyl – is incredible! because as you’ll clearly hear – this baby rocks! Humble Pie had to rock because they followed a blazing performance by Slade. From a concert on May 6th, 1973 at San Francisco’s Winterland Theatre. Opening this show was a little known band then named Steely Dan. Marriott is on fire from the fist note to the last. there is more material from this show, maybe so. Most gigs from this time period, however, did not run too much over an hour’s worth of material, especially, when three or more bands shared the bill. My only gripe with this package is the packaging, itself! Open the gate fold & do we get a concert photo of the band at Winterland? No! A generic photo, instead. Winterland has some historic significance that should have been highlighted with some photos of that gig or at least the marquee. And, why is the included poster that of a gig in Europe? Why not a replica of the hand bill that Bill Graham had reproduced of the gig at Winterland? Cleopatra Records gets an A+ for releasing this on vinyl. The sound is fantastic! Cleopatra Records gets a D for liner notes. Do your homework, guys. This is historical stuff and deserves the full package and better information. 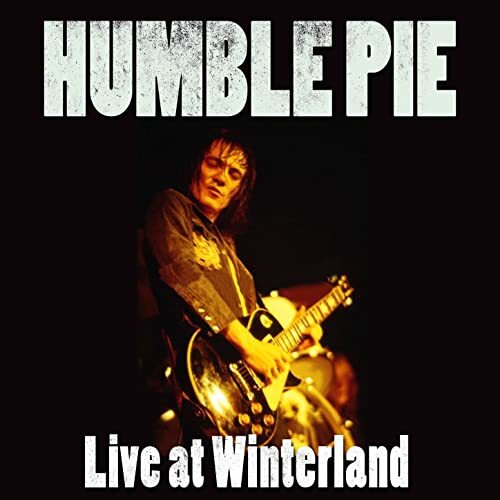 This live recording of Humble Pie was made at San Francisco’s Winterland Ballroom in May of 1973, during what many consider to be the band’s creative peak. This Winterland show being only the fifth show recorded for the then brand-newly syndicated King Biscuit Flower Hour radio concert series, features a blistering set of material. From “I Don’t Need No Doctor” to the infectious Top 10 hit “Hot ‘N Nasty” this recording features all the essential music from the Humble Pie catalogue. And since the band built their reputation on legendary live shows, is arguably better than anything the band ever did in the recording studio. Humble Pie first came together on New Year’s Eve, 1968/69. Marriott had just played a disastrous gig with The Small Faces, whose opening act, oddly enough, was Ridley’s Spooky Tooth. Frampton had already left The Herd and was forming a new band with Shirley, a child prodigy drummer, who was only 16 at the time. Marriott called Shirley after the show and asked if he and Ridley could join the new band he and Frampton were assembling. According to Shirley, he couldn’t believe a singer as acclaimed as Steve Marriott was even interested, and was “thrilled” at the prospect of what the new band could achieve. The band made its debut in April of 1969, but almost collapsed at the onset. Despite the media hoopla surrounding their supergroup status and a slew of critical raves, Humble Pie’s early albums (As Safe as Yesterday Is and Town and Country – both on Oldham’s Immediate label) were not commercial hits. Marriott and Frampton couldn’t decide if the band should move in an acoustic or electric direction, a dilemma that made the initial records hard to market. The band also had to hit the road before they really had time to work out their live show, and early tours were mostly lackluster as a result. Then, in 1970, the tides began to turn. The band hired Dee Anthony as its manager, who promptly signed them to A&M Records. The band recorded Humble Pie and Rock On in 1970 and ’71, respectively. Both albums forged the band into a solid – and very electric – blues/rock machine. The critics got behind the band en masse, and records began selling in large numbers. By the time the band had recorded and released Rockin’ The Fillmore in 1971, the word had spread: Humble Pie was one of the hottest live band since the Jimi Hendrix Experience. Just then, Frampton decided he didn’t feel comfortable in the band’s hard rockin’ blues direction and left to pursue a solo career. While the most memorable material from Rockin’ The Fillmore (“I Don’t Need No Doctor,” “4 Day Creep” and the soulful remake of Ray Charles’ “Hallelujah I Love Her So”) also appear on this LP, but the versions differ dramatically, as Frampton had since been replaced by Dave “Clem” Clempson. Though some in the rock press predicted the band’s demise upon Frampton’s departure, the opposite seemed to happen. Clempson revitalized the band, and helped take it in an even harder direction. When the band returned in 1972 with Smokin’, they had become a well-oiled rock ‘n’ roll dynamo. Five of the album’s tracks – “Hot ‘N Nasty,” “30 Days In The Hole,” “Road Runner,” “You’re So Good For Me” and Eddie Cochran’s classic “C’mon Everybody” – soon became radio staples. Smokin’ became a multi-platinum Top 10 smash, and remains the best selling album of the band’s career. This concert was recorded while the band was promoting Eat It!, a double LP that featured three sides of studio songs and one side of live material. Though Eat It! went to the Top 15, and Humble Pie had firmly established themselves as a powerful live act, the band’s powers (and their popularity) seemed to gradually decline following this tour. The band returned in 1974 with Thunderbox, but the constant focus by the media and the fans on Steve Marriott began taking its toll within the group. In 1975, Humble Pie reunited in the studio with ex-manager Andrew Oldham, and recordedStreet Rats, a quirky collection of tracks, including three Beatles covers. The band embarked on a “Farewell” tour, and called it a day. Though Humble Pie never quite reached the commercial status of Led Zeppelin or Eric Clapton, they did leave an indelible mark on the contemporary rock music. The passion of Marriott’s blue-eyed soul, the powerful blast of the band’s clever rhythm section, compounded by the skillful guitar work of Frampton (and later, Clem Clempson), will forever keep Humble Pie near the head of the blues/rock class of legends. Steve Marriott – Guitar, vocals. Clem Clempson – Guitar, backing vocals.